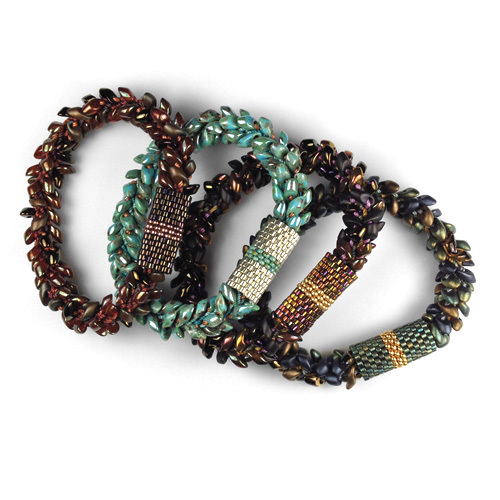 The Bead, Cord & Clasp Pack includes complimentary copyrighted PDF instructions. The downloadable PDF manual is 12 page long and contains over 30 pictures making this project easy even if it is your first kumihimo project. 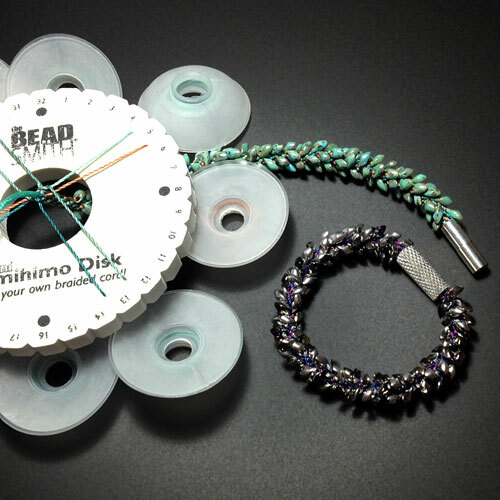 It includes instructions on how to set up your cords on the K-Disk, how to load the Long Magatamas, how to braid, how to braid with beads, how to remove your project from the K-Disk, and how to prepare the ends for the clasp and how to finish the project. It has a what if? 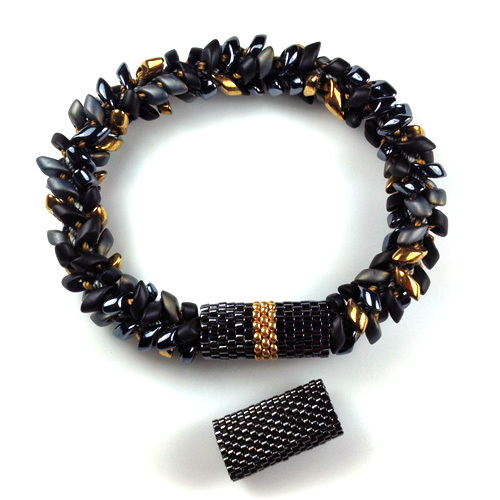 section, plus the standard women's bracelet length and how to care for the bracelet. The cords in the Bracelet Packs are pre-cut and ready to be inserted in the slots in the kumihimo disk for your convenience. The Long Magatamas bead mix has plenty of beads. Tool Bags specifically designed for this project are available. 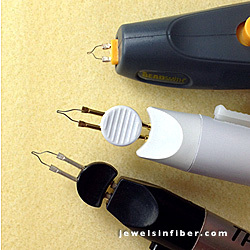 They include: a Mini K-Disk, 8 EZ-Bobs, a Weighted EZ-Bob, a Mini-Clamp, and a Big Eye Needle. If you have all the materials and tools on hand, you can purchase the PDF manual by itself. 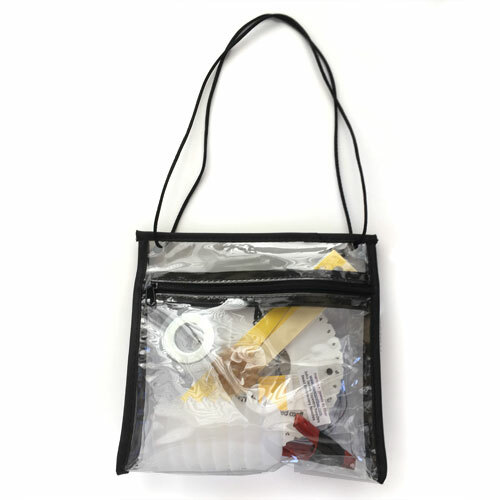 In addition to the materials included in the Packs and the Tool Bags, you will need a heavy duty scissors, shear or snips, plus an adhesive to attach the clasp such as Poly Zap Super Glue, Zap Jewelry Gel or Devcon 5-Minute Epoxy. 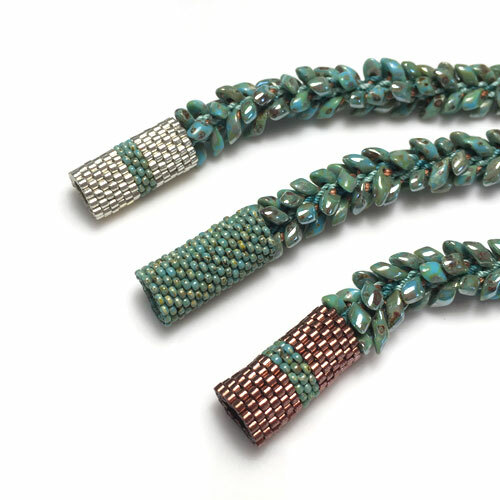 Adding a Peyote Bead Sleeves over the magnetic clasp is the best way to ensure that the clasp holds and does not get lost. The bead packs have ~ 2 to 2.5 g of beads. All the beads are Miyuki Delicas Size 11, ora mix of Medium DelicasSize 11 and Seed Beads Size 11, or all Seed Beads Size 11. 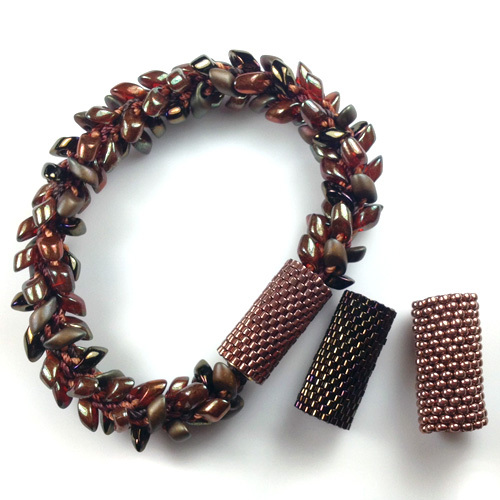 The Gold, Silver and Copper beads are Duracoat Galvanized beads. The thread included is chosen as the best color match and may be one of the following: C-Lon Bead Thread Size D, KO or Miyuki Beading Thread, WildFire .006 or 6 lb FireLine. 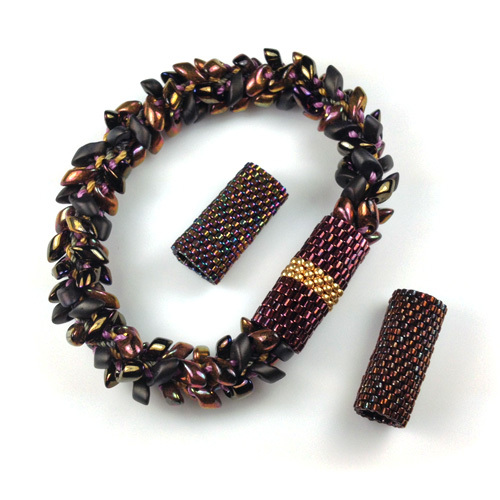 Sleeves made with Delicas, or Seed Beads Size 11 are made with flat even-count peyote. The Sleeves made with a mix of Medium Delicas Size 10 and Seed Beads Size 11 are made with odd-count peyote. If you have never done peyote before, start with sleeve made Delica. The delicas fit together very well due to their even sizes. This is a very unusual bead mix, one side of the Long Magatamas is silver with irridescent colors such as gold, oranges, magentas mixed in, the other side is transparent but glows... 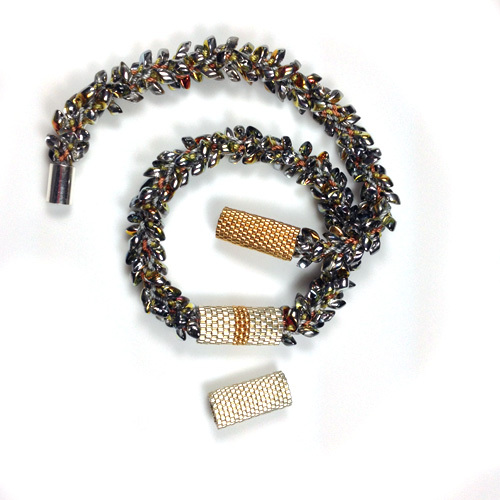 The bead sleeve over the clasp is an added feature and is best for this piece in silver, gold or a combination of both. Make 1 bracelet - The cords are pre-cut and ready to braid. 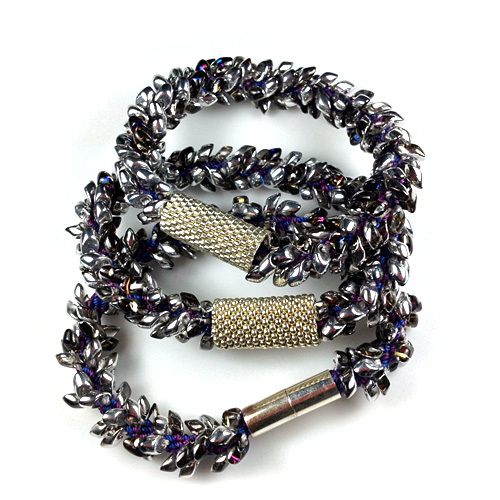 Similar to the Starlight mix above, with one side of the Long Magatamas silver, and the other side a mix of transparent colors with blues, magentas & more... An alternative bead spacing is shown on the bottom bracelet. The optional bead sleeves are silver. Mostly deep blues, with sheen of chartreuse, cobalt blue and some purples. 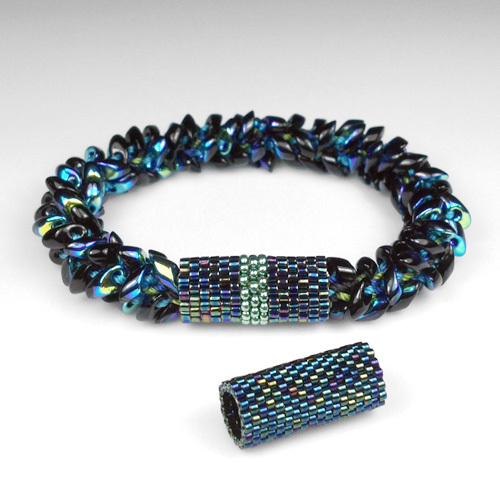 The optional feature, the beaded sleeve work well with the bracelet. 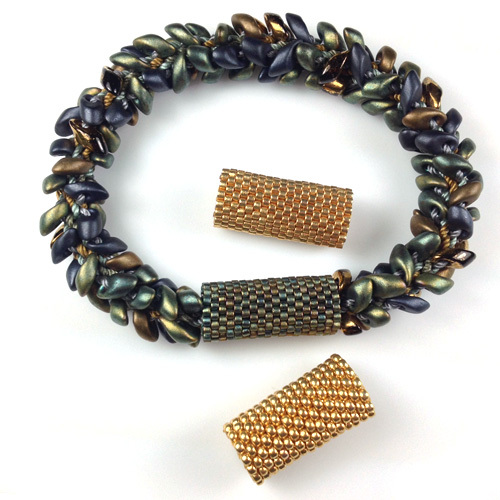 Copper and Picasso Turquoise, a new option for the sleeve color, completely transforms this bracelet. It becomes earthier with copper in the mix... The original classic Turquoise and Silvercolor combination is a bit more dressy. 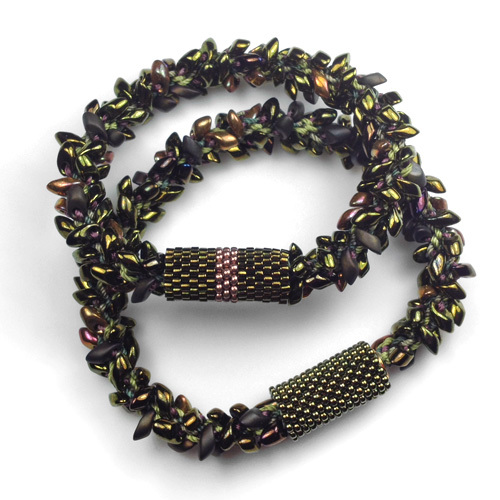 A new color combination, with metallic olive Long Magatamas combined with rich gold, copper, pink and matte olive tones. The sleeves match the Long Magatamas. Great worn with in combination with Copper Rose, Mahogany or Turquoise Moon. 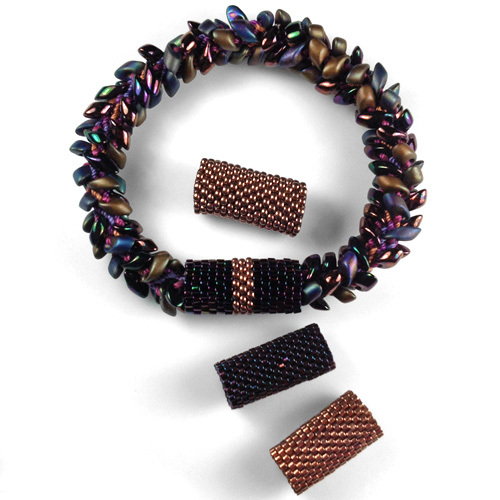 An elegant, classic mix with shiny, metallic and matte beads. Fresh and bright, but with enough deeper matte tones to be sophisticated. Several options are possible for the beaded sleeves. 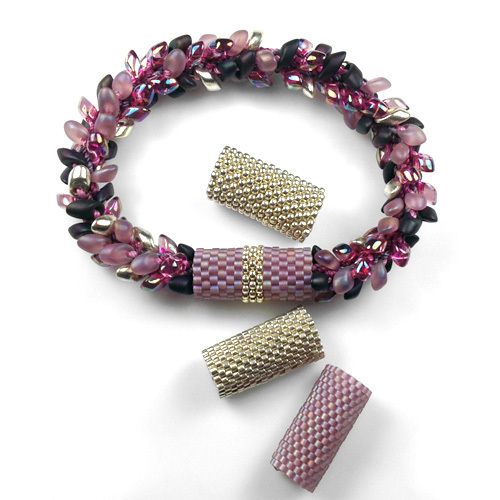 The silver beads enhance the silver Long Magatamas, the matte smokey pink ones bring out the soft pink of the bracelet. Razzleberry bushes - they grow all around my neighborhood and this mix looks just like them when they are in bloom in the spring... Soft copper or deep plum tones work well for the optional bead sleeves. Add all the tools for this project including a bag to take your project on the go! Package of 4 needles. Blunt ends. 2 size 10, 2 size 12. Designed for bead embroidery, so shorter than the standard English bead needles. Works well with Peyote Stitch and all the beading thread. Personal note - I prefer blunt ends over the regular beading needles. The blunt ends lower the likelihood of splitting the thread when going through the beads multiple times, plus they are short and length is not needed for Peyote! This is a 12 page PDF document with over 30 pictures. This will take you directly to a Paypal checkout payable with any major credit or debit card. Once your payment is complete you will be redirected to a web page with the link to the PDF and the password. Save the password and bookmark the page for future viewing. Please Note: These instructions are copyrighted and are for personal use only. If you would like to use these instructions to teach, either buy a set of instructions per student or get Bead, Cord & Clasp Packs for each student. Do not duplicate this document either in print or in an electronic manner. When purchasing this PDF, it is assumed that you agree with the terms of the copyright of this document. 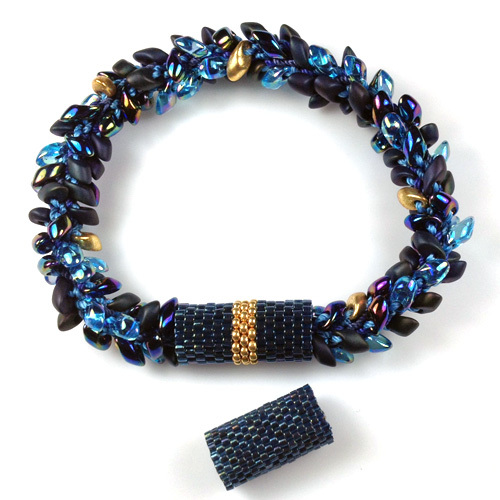 As to bracelets make as many as you wish - it is an original adaptation on a basic kumihimo design. See additional note on copyright below. Thanks for understanding! Copyrights - This design is an adaptation of a basic design. Only the instructions are copyrighted, not the actual design. You welcome to make and sell as many bracelets as you wish but please understand that the instructions are for personal use only. If you would like to use these instructions to teach, buy kits for your students. Do not duplicate the instructions either in print or in an electronic manner. When purchasing the kit or PDF listed above, it is assumed that you agree with the copyright terms of this document included in the kit. Thanks for understanding!